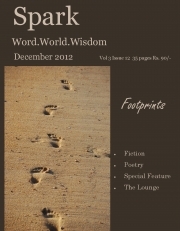 Description of "Spark - December 2012 Issue"
This month’s issue is a different approach to our monthly themes. We have gone ahead and interpreted a picture (the cover image) and come up with a series of fiction and poetry and a special feature on marathon runners for you this month. In addition, our non-fiction specialty segment The Lounge explores books, movies, spirituality and the slice of life sections. We hope you enjoy this short and sweet issue which also happens to be the last one of this year. Please note : The printed copy will have coloured cover and black and white interior. Reviews of "Spark - December 2012 Issue"